Transocean (Sort of) Turns a Profit. Is It Time to Buy This Incredibly Cheap Stock? You have to make a lot of adjustments for one-time expenses, but the parts of the business generating revenue reported a profit this past quarter. After posting a loss of more than $1 billion in the prior quarter, the idea of offshore rig owner Transocean (NYSE:RIG) producing a profitable third-quarter result seemed pretty far-fetched. If you can squint past some of the one-time charges related to asset impairments and integration costs, though, Transocean actually generated a profitable quarter. Let's take a look at Transocean's third-quarter results and whether this quarter is a sign that things are going to only get better from here. DATA SOURCE: TRANSOCEAN EARNINGS RELEASE. EPS = EARNINGS PER SHARE. So yeah, the definition of turning a profit is a pretty generous one this past quarter, as the company reported a loss of $400 million. Included in that loss is $432 million related to an impairment charge for two rigs that management has announced for retirement and is holding for sale. Toss in another $7 million in other one-time items, and the company's adjusted net income result was a positive $30 million. It doesn't sound like much, but the fact that Transocean is generating a profit is quite remarkable. The offshore rig business is still very much in a rut, with low utilization rates giving customers a lot of pricing power when negotiating new contracts. As management noted, though, it is producing an EBITDA margin (adjusted for writedowns and impairments) greater than 40%. Also, it is finding enough work for its rigs for the company to grow revenue. It appears that this growth trend should continue as well. According to the company's rig fleet status, the company won nine contract awards, three of which were for units that were formerly idle or under construction. Over the past 12 months, Transocean has signed contracts worth $1.5 billion in backlog. It is still drawing down its current backlog but at a much slower rate than in prior quarters. It's no secret that offshore rig stocks are cheap today. Most of the companies in this industry still trade for a considerable discount to their book value. Transocean's management has been taking advantage of the situation by making acquisitions, including its purchase of Songa Offshore at the end of last year and acquiring a rig under construction from Seadrill. During this past quarter, the company doubled down on this strategy by acquiring Ocean Rig UDW (NASDAQ:ORIG). While Ocean Rig has a fantastic fleet of modern rigs well suited for today's drilling demands, the company was struggling with a lack of work and the cash commitments for a couple of its rigs under construction. So Transocean swooped in and acquired Ocean Rig for $3 billion. With this acquisition, Transocean further strengthens its position with the largest fleet of high-specification rigs. What's more impressive, though, is that the price it paid for these assets equates to about $280 million per rig. Typically, a new-build rig today costs more than double that. So the price it is paying looks like quite the steal. As part of the company's press release, CEO Jeremy Thigpen highlighted some of Transocean's recent contract awards as well as the benefits of the Ocean Rig acquisition. We remain encouraged by the increase that we are experiencing in floater contracting activity. Over the past three months, as a testament to our fleet quality, operating performance and customer relationships, we secured almost $500 million of new backlog, bringing our 12-month total to over $1.5 billion. In preparation for an offshore recovery, during the quarter, we also continued the high-grading of our fleet by announcing our agreement to acquire Ocean Rig. With its strong balance sheet, and fleet of 11 high-specification ultra-deepwater drillships, two of which are currently under construction, and two harsh environment semi-submersibles, Ocean Rig presents us with a unique opportunity to continue enhancing both our fleet and our optionality as the market recovery unfolds. I can't say with any certainty whether this is the last time we'll see Transocean take some large writedown charges in a quarter. There are still a few older, less-capable rigs left on the books that will likely get retired, so investors should be ready for more of these charges in the future. At the same time, though, Transocean's business is looking much better than it did a year ago. The addition of Songa Offshore gave it some good assets with a considerable backlog, and adding Ocean Rig's fleet will help the company capture even more work as the offshore industry starts to rebound. Management estimates that oil and gas producers will tender work for 57 rigs not currently active for a total of 87 rig-years of work. 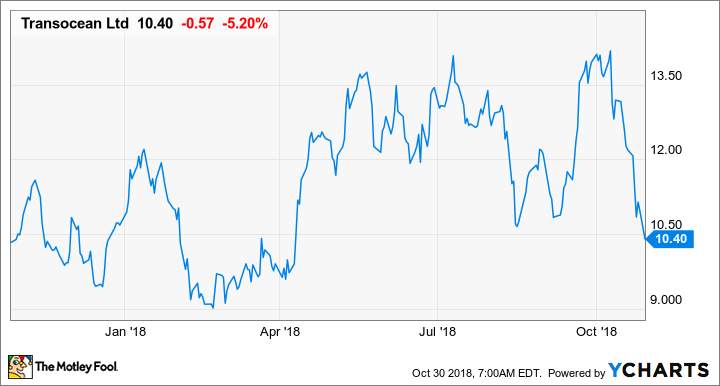 If that is indeed the case, then Transocean is likely going to have a much better 2019, and investors may want to consider this beaten-down stock.